MiscData Editor can edit the MiscData file from common2.pac, which controls the stages and characters that appear on all 19 stages in All-Star mode. Note: if you're adding more characters to a level, you should first copy the information from another level with the Copy Section tool. 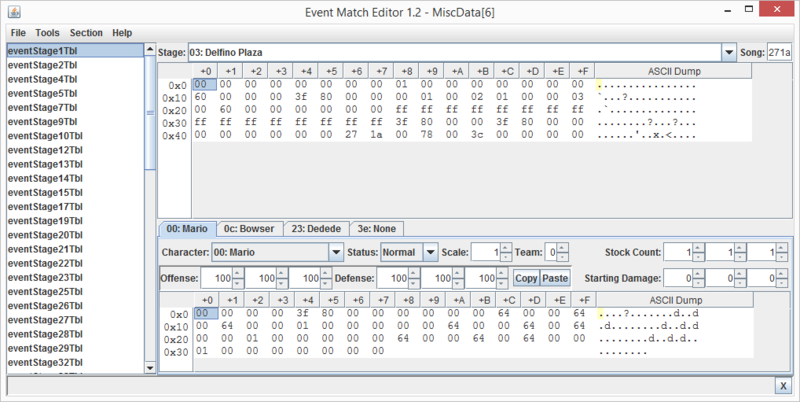 MiscData Editor can edit the MiscData file from common2.pac, which controls the event matches in the game, both 1P and 2P. These programs are available under the GNU General Public License, version 2 or later. Source code is in the JAR file. There is NO WARRANTY. You should probably back up your files before editing them. The hex editor component was written by Robert Futrell (http://fifesoft.com/hexeditor). It is available under this BSD-style license.